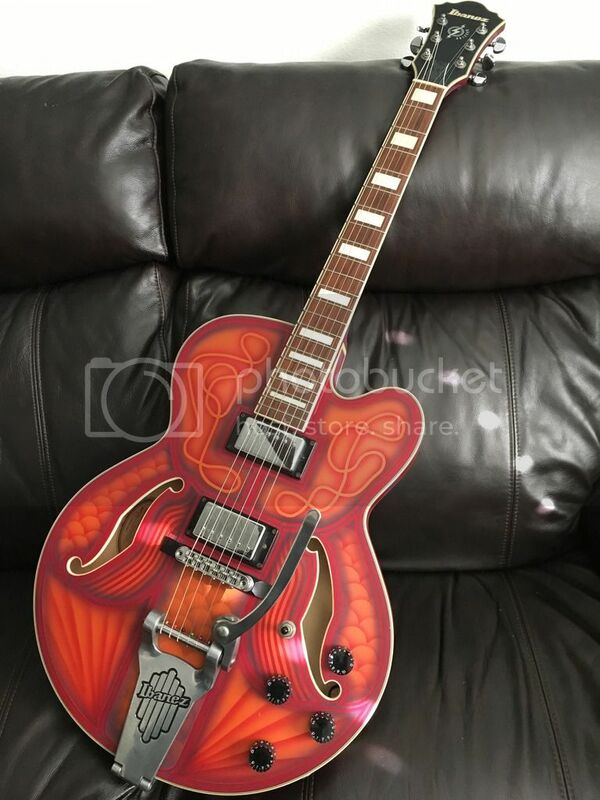 Part of the deal with CB's airline was this Ibanez artcore with a neck repair. 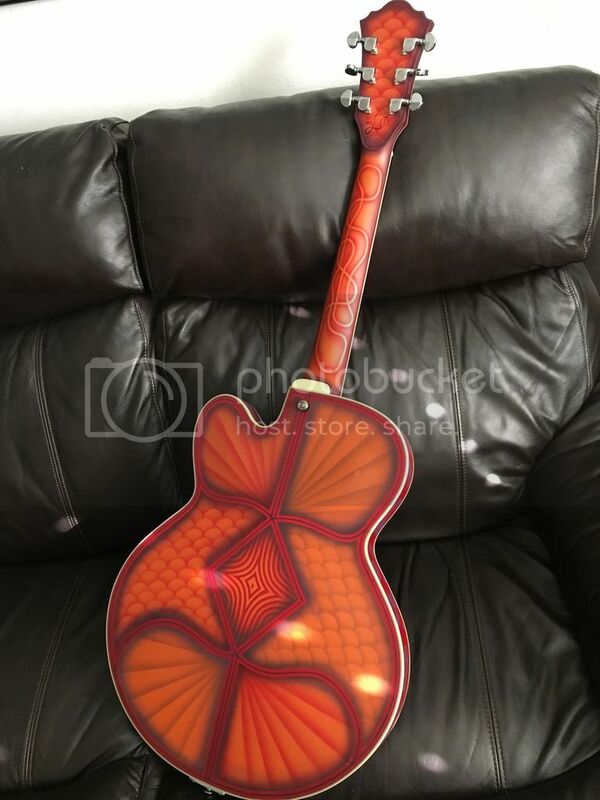 I couldnt just leave it alone and decided to do a full kustom paintjob on it using the red that was already on it. and then went to town! this is the end result!!! I ended up using Orange, Kandy red, burnt orange, and purple. i then finished it off with a flat clear. 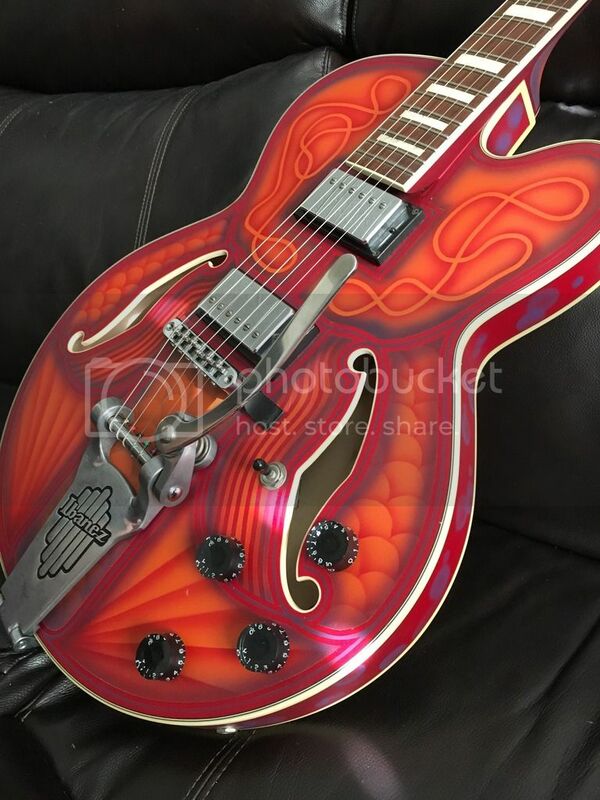 i decided to use this as practice for a gretsch that im now finishing up. Stay tuned for progress on that!!! Awesome as is. 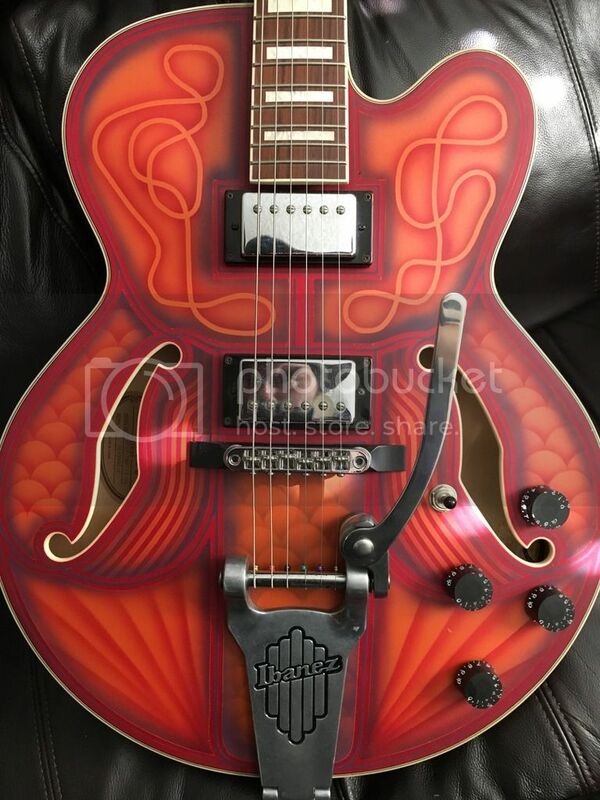 Although I think a 'frosted' clear pickguard could suit this perfect. Fabulous! Reminds me of an art deco theater. ....you left the lightning bolt! This is friggin' amazing work! Wow! THAT's really an ARTEfact!! Ha yes that about sums it up!! Lowrider style is exactly what I was going for. Gorgeous. Really beautiful work. Is see you have a 1940 Ford. Do you paint in the Custom Car culture world? Good choice keeping the lightning bolt. 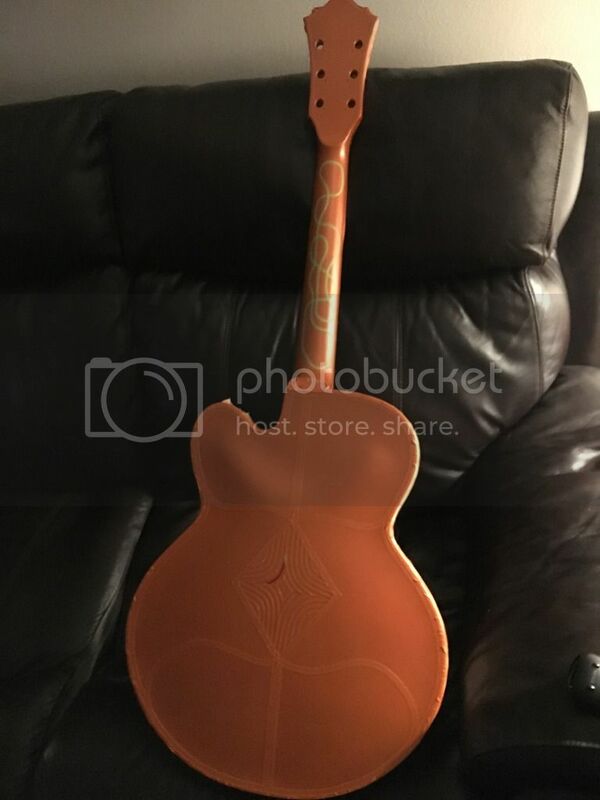 Every guitar should have one. Incredible work! I love this multi layered look and I think I understand how you did all the stripes and the shades around them. But how are you doing these "fish scales" and "sunbeams"? 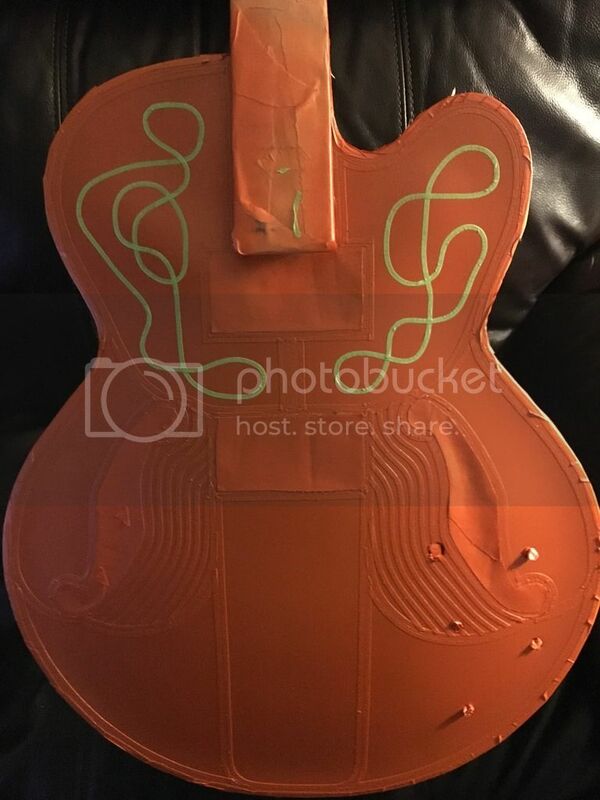 Maybe while doing your Gretsch project you could take some step by step photos? Thanks! It's actually a Buick. I have only painted this one car but I did help some friends do body work on their cars some time ago. I decided to paint it limetime green and then I drew inspiration from the infamous 30's race plane: the gee bee, for the scallops in off white. I prefer guitars because cars are a lot more work and more expensive! The scales and fades are actually quite easy. For the scales I took a notecard and drew touching circles, then I cut the top halves with an exacto knife and that's how I made a stencil. You start from the top, airbrush around the stencil, then move downward making sure that the following rows are lined up from edge of circles to middle of circles. The fades are even easier... just use a straight edge, airbrush, and move along the space with a set starting point for all the lines. It takes practice to make them even but it's not too hard. 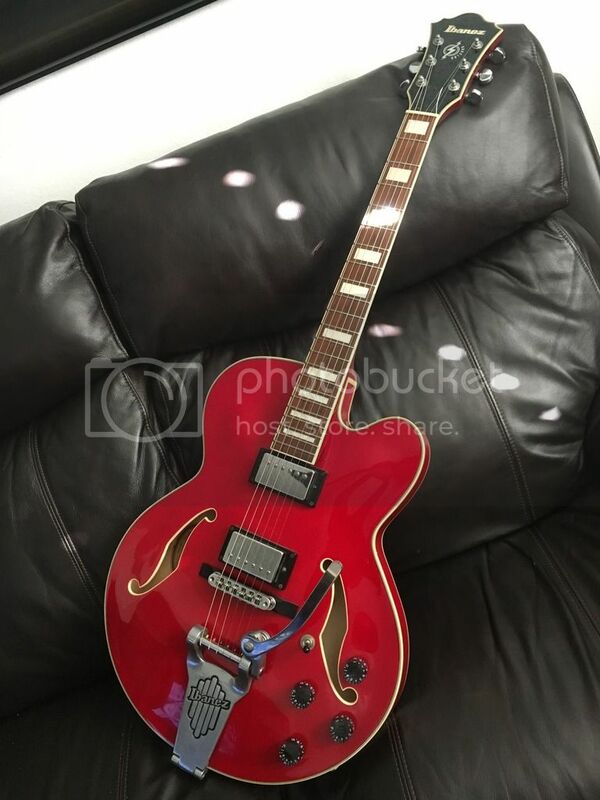 Hope this makes sense.... as for the Gretsch, it's already cleared and curing at the moment so no can do on step by step, maybe on the next one! Looks great! And with that color scheme, the curlicues on the upper bout and the back of the neck look like spaghetti! Very tasty! Looks incredible !!!! Amazing !! !